This storm lasted about 90 minutes and we received about 3/4″ of rain, but the winds were not as severe as July’s storm (Monsoon Storm #1). 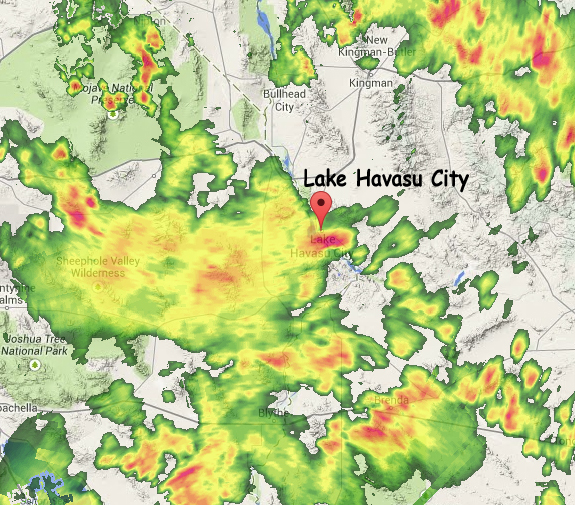 However, like the last monsoon storm, we lost power again. Only 2 hours this time. The best thing about it was that the temperature dropped to the 70s and 80s — the first time we’ve seen temps less than triple digits since May. Yahoo! A movie . . . But we’re certain it wasn’t a fish. 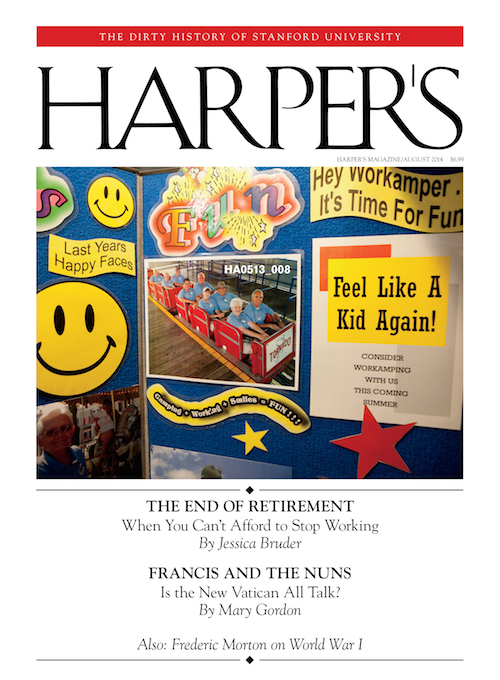 With that I recommend reading The End of Retirement by Jessica Bruder in the August 2014 Harper’s magazine. If you don’t have a subscription to Harper’s, you can listen to an interview with the author about this article on National Public Radio. The End of Retirement is a slice of RV life — the darker side of RV life. It’s about those older RVers who have retired, but must still work for a living in order to get by. Bruder tells her story through the stories of several RVers who, though not destitute, have fallen on hard times and must continue to work in their golden years. Some of the jobs these seniors take would be hard enough for someone much younger. I thought Bruder’s portrayals were empathetic, not patronizing, but it looks like others in the RV full timing community don’t share my view.
. . . the article, written by a so-called “subculture journalist” is a twisted exploit on a small minority of work campers who are down on their luck and does nothing but portray full-time RVers as sad, broke and destitute people who have no choice but to live on the road. I thought this was a bit harsh and visited the web site of the couple who had posted this review. Turns out their ad-laden web site is in the business of selling full-time RVers How-To-Make-Money products and services. My take away is that they wanted to dis the article because it could interfere with their business plan. On the other hand, there seem to be a number for RVers who don’t like the article for one reason or another. But I think some of their resentment is the fact that Bruder is a journalist and not a full-time RVer. To me, this is just another case of where the fish won’t be the one discovering the water. Walter, maybe it was my time in Korea during the 70s when I was in the army or the Arizona sun, but I’ve become a K-POP fan — the girl groups that is. Well, maybe the real reason for the interest is the svelte Asian 20-somethings, eh?